More than 60 years after the first BR diesel railcars were introduced, the final vehicles in regular passenger service have been retired. 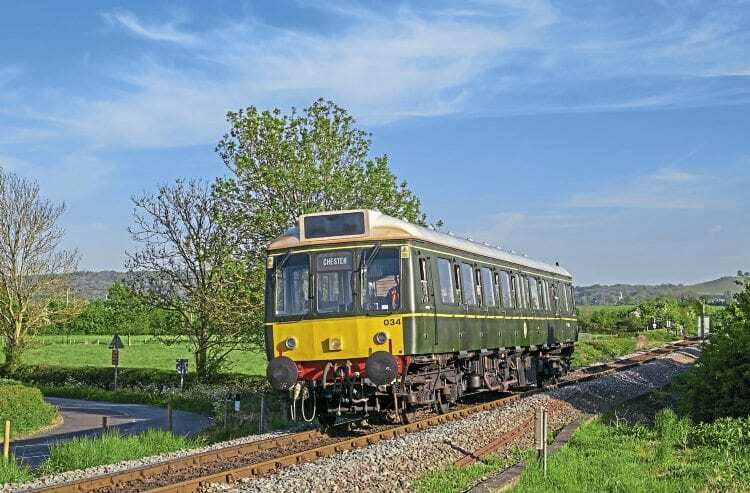 Chiltern Railways withdrew its two 1960-built Class 121 ‘Bubblecars’ on May 19, marking the occasion with a special event on the Aylesbury-Princes Risborough branch where they have worked since 2003. The withdrawal of the Pressed Steel ‘121s’ also marks the end of vacuum-braked passenger vehicles in regular service, more than 50 years after BR started the changeover to air brakes. Chiltern blue No. 55020 (121020) and BR green No. W55034 (121034) were paired for the final workings, which drew enthusiasts from all over the country, keen to experience these 57-year-old slam-door suburban railcars on the main line for the final time. The two railcars worked all day on the branch, rather than just their usual morning and evening peak hour diagram, with trains running ‘full and standing’ all day. Former GWR 150 chocolate and cream-liveried No. 55020 had been out of service for some time, leaving No. W55034 to work alone during the final weeks, but was repaired in time to work on the last day.